JRC "SMART ELECTRICITY SYSTEMS AND INTEROPERABILITY"
The Joint Research Centre is the scientific and technical arm of the European Commission. 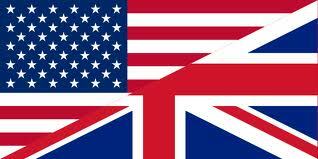 It is providing the scientific advice and technical know-how to support a wide range of EU policies. The JRC has seven scientific institutes, located at five different sites in Belgium, Germany, Italy, the Netherlands and Spain. The JRC Smart Electricity Systems and Interoperability team is located both in Petten (NL) and Ispra (IT). The European power grid, one of the largest and most complex systems in the world, is undergoing challenging technological, social and regulatory modifications. Meeting the EU's climate change and energy policy objectives for 2030 and beyond requires a major transformation of our electricity infrastructure. Upgrading and reshaping the existing networks is of paramount importance to foster sustainability, increase energy efficiency, enhance grid security and attain the internal energy market objectives. Many countries - in Europe and worldwide - are thus promoting super and smarter grid concepts for the integration in the power system of new actors and technologies such as renewable energies, distributed generation, storage devices and electric vehicles. The pervasive deployment of Information and Communication Technology (ICT) for upgraded monitoring, control, and protection functionalities is a key prerequisite and enabler for these changes to happen. The move towards renewed and redesigned power grids shall be carefully monitored and studied system-wise and technology-wise. We, as European Commission’s in-house science service, perform independent scientific research and support EU policy-making on transformations towards smarter and interoperable electricity systems. Data Gathering and Processing - We constantly develop, update our extensive databases of power systems/networks and smart grid projects in Europe. This work feeds into our modelling, experimental and dissemination activities as explained below. Smart Grid Interoperability Lab - Our Lab analyses behaviours and characteristics of evolving power grids incorporating more renewables, electric vehicles, dispersed energy resources. 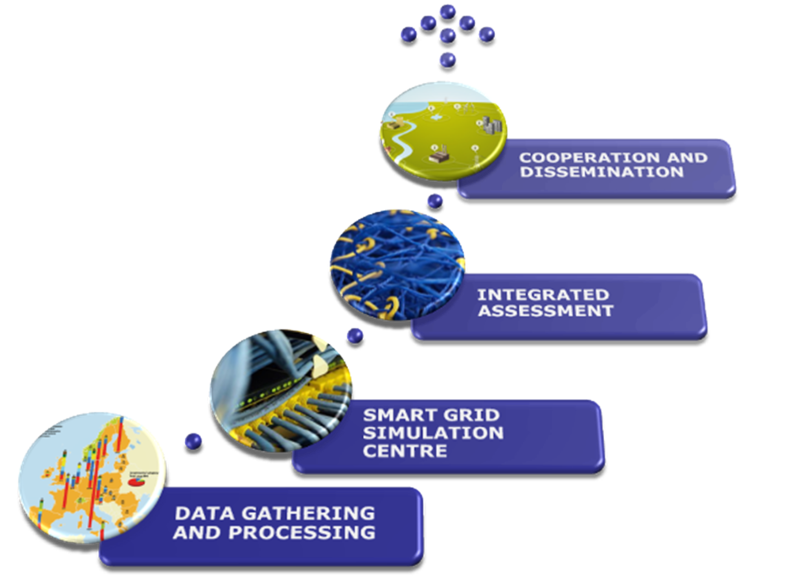 Integrated Assessment - Our aim is to support policy initiative and study smart grids as complex techno-socio-economic systems with multiple physical, cyber, social, policy, and decision making layers. Cooperation and Dissemination - Our work builds upon synergistic cooperation with key stakeholders to reach a critical mass. Tailored communication initiatives are adopted and customised dissemination tools are developed to get our message across. The Europe-wide smart grids inventory. Intelligent electricity networks – Smart Grids – are a key component in the EU energy strategy. In the last few years, Smart Grid projects have been growing in number, size and scope throughout Europe. Where are they taking place? What are they dealing with? Who is leading them? What progresses have we made? 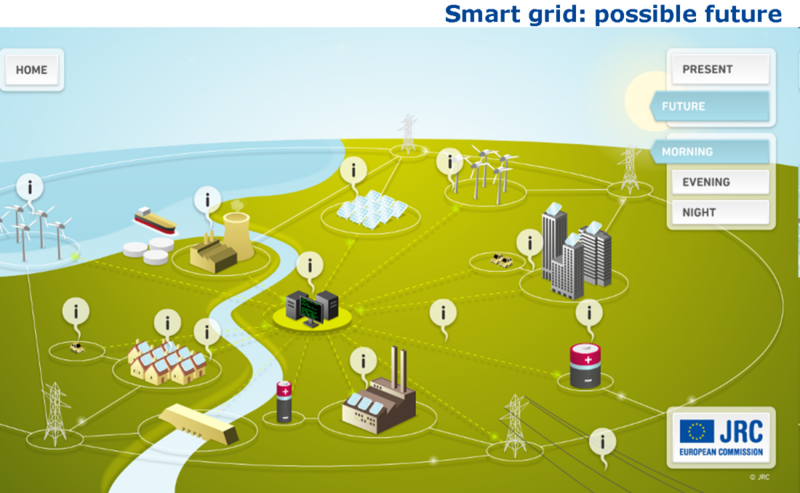 To answer some of these questions, the JRC manages and regularly updates a comprehensive inventory of Smart Grid projects in Europe. The 2017 edition of the survey includes 950 smart grid projects, amounting to €5 billion investment. Project results provide an encouraging indication of how Smart Grids can help integrate more renewables, accommodate electric vehicles, give more control to consumers over their energy consumption, avoid blackouts and restore power quickly when outages occur. Cost-benefit analysis of smart grids. We have defined a comprehensive assessment framework of Smart Grid projects centred on a cost‐benefit analysis (CBA). A European Smart Grid project (InovGrid) has been used as a case study to fine‐tune and illustrate the proposed assessment framework. To the best of our knowledge, this is the first study to actually test a CBA on a real project. This work draws on a methodology proposed by EPRI (Electric Power Research Institute) and on the existing collaboration between the EC and the US Department of Energy (DoE) in the framework of the EU‐US Energy Council. Smart grid interoperability testing and real time simulation. We developed laboratories equipped with power components (cables, batteries, electric vehicles,..), Information and Communication Technology (ICT) systems and advanced power system real‐time simulators, to study the behaviour of emerging electricity systems in high power applications and perform integration tests with physical Hardware‐in‐the‐Loop (HIL) simulation. The experimental set-ups are being used, among other things, to perform interoperability and integration studies on complex power transmission and distribution grids including renewables (onshore/offshore wind, solar power,..), electric vehicles, and storage systems. European electricity grid models. We build models starting from data from the European System Operators, complemented by other datasets from the European power system. As an example, the European power grid model includes more than 10,000 elements (nodes and lines) of Europe's transmission grid and can be used to run static and dynamic analyses of the European transmission network via advanced power simulation platforms. Interactive tools and maps. We develop several interactive tools to explain the public the challenges and merits of smart grids deployment and to make the results of our research available in an intuitive way.